Turns out the ‘InertiaDrive’ reel system and ‘Staysharp blades aren’t just a gimmick. Fiskars have produced an outstanding manual mower that combines several innovative features with solid build quality to deliver an amazing cut. At 23kg, the sheer weight of the mower can be an issue if you have any slopes in your garden. The cutting mechanism is very well put together, and the mower feels solid enough to last for many cutting seasons. The ‘staysharp’ blades are precision-ground, hardened steel blades, and the (contact free) cutting mechanism should help ensure that they do not need sharpening too often (unless you make a habit of hitting rocks). Nevertheless, you might be wise to purchase the official sharpening kit to put a new edge on the blades at the start of each mowing season. The StaySharp Max is thoughtfully designed, with quality components and a premium feel. 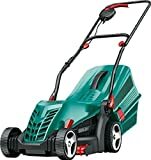 You might initially be surprised by the weight of it, but when you push it this is counteracted by the ‘InertiaDrive’ system that actually means it takes little effort to move, and the weight ensures it has adequate grip on the lawn, thereby driving the blades more consistently to deliver an even cut. The weight does mean however that you might have trouble carrying it up and down steps if you need to do this to access the lawn, and this isn’t helped by the handle, which has a slightly awkward fastening mechanism. These are minor inconveniences however to what is generally a very well-designed machine, and one that is ready from the word GO! Being quick to assemble out of the box, and arriving with blades already sharpened. The design gives two possible options of where to regurgitate the grass clippings, which are thrown up evenly and not in clumps like some mowers. These can go to the rear or to the front. Most people will probably find the front setting more satisfactory as it means your shoes don’t get covered in bits of grass. You can also attach the grass collection box on the front, which is available as an optional extra. Bear in mind that like all push mowers this is not designed to cut long grass, and is height adjustable to cut between 1” and 4”. Any longer than that and it will take a couple of passes to achieve a decent result. The cutting mechanism of the Fiskars, like most reel mowers, works like a pair of scissors – using two blades to cut the grass rather than one, much like the difference between scissors and a machete. This creates a clean cut, unlike the lacerations created by rotary mowers which can tend to leave rough edges on the grass. This not only improves your lawns appearance in the short term, but helps keep your grass healthier. To achieve the best result I would recommend mowing twice. Make a first pass over the lawn at a high cut setting, and then drop the mower down to 1” to create a manicured appearance like a chipping green. The manual recommends that you do not cut more than 1” of grass at a time, so you might need to cut twice a week at least in mowing seasons. Another key feature that helps achieve a good cut is the inset wheels and blades that extend across the full width of the mower. This minimises the frustration of missing strips and tricky edges next to fences and walls. Bear in mind you will probably still need another trimmer of some kind to take care of the extreme edges. The contact free cutting mechanism, and Inertia drive system, ensures that the Staysharp max is much easier to push than standard reel mowers. 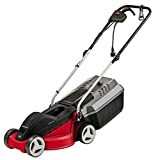 This means it should have no problems pushing through heavy grass, and can even tackle a few small weeds when its set on the highest cutting adjustment (4 inches). Turning corners however, is slightly more difficult – and the mower does not have a very small turning radius. Still, it is easily as manoeuvrable as most electric or petrol mowers. But unlike most electric or petrol mowers, it cannot cut when pulled backwards, which can make mowing an irregularly shaped lawn tedious. The mower becomes easier to use if you have a strategy to minimise turning, as the InertiaDrive system makes it a breeze once it has a bit of momentum. This is easily stopped however by sticks and twigs, so rid your lawn of any debris BEFORE you start cutting to minimise stopping and starting. With a bit of practice mowing is a breeze, and faster than many electric or petrol mowers. The InertiaDrive Reel system has been designed to solve one of the biggest problems typically found with manual mowers; the sheer effort required to push them. Fiskars are filing a patent for this system which claims to deliver twice the cutting power from the same forward motion, meaning you can blast through the twigs, weeds, and bumps that would jam other push mowers. The StaySharp Max also has a higher cutting height than most reel mowers, at 4”, which when coupled with the powerboost from the InertiaDrive, means it is more able to tackle thick grass and can be operated by those with less mobility.